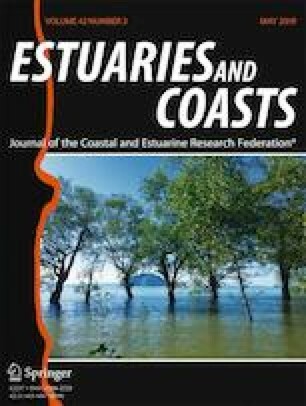 Large accumulations of stranded macroalgae on the beaches of Sanibel Island from 2004 to 2007 were unusual and thought to be driven by high rainfall and river flows stemming from a high frequency of hurricanes. The southwest Florida shelf was thought to be isolated from far-field effects such as high river flows and urbanization but field- and laboratory-based studies suggest that nitrogen enrichment, fragmentation, and species composition of macroalgal communities on the shelf and in the estuary contribute to beach stranding events. Macroalgae were sampled using a belt transect method to determine species distribution and abundance. Macroalgae were abundant (1) in the lower estuary with abundant seagrass and (2) on limestone outcroppings in the Gulf of Mexico. An MDS analysis of the quadrat samples indicated two distinct macroalgal community types, a “Sound” assemblage around Pine Island Sound and a “Gulf” assemblage, associated with a live bottom and patch reef in the Gulf of Mexico. Peak abundances for the two community types differed with the Gulf having peak abundances from July to November, while peak abundances in the Sound occurred from January to July. Sound macroalgal tissue had significantly enriched δ15N compared to Gulf tissue when all species were combined and in five of six species collected at both locations suggesting that stable isotope analysis could be useful in combination with species composition in determining the source of macroalgae during stranding events. In addition, a laboratory study was conducted on four species that were sampled and frequently collected as a result of stranding events. Laboratory growth experiments demonstrated the potential for three of four common species (Solieria filiformis, Gracilaria tikvahiae, Agardhiella subulata) to fragment and grow significantly more under elevated nitrate conditions. This was supported by a grant from the City of Sanibel, Lee County, and the West Coast Inland Navigation District to E. Milbrandt. Several other Co-PIs from Florida Gulf Coast University contributed to the overall effort including A.N. Loh, E. Everham, and D. Fugate. This is contribution 0034 from the Sanibel-Captiva Conservation Foundation Marine Laboratory. The authors would like to thank an anonymous reviewer for their feedback on an earlier draft and would like to thank the Associate Editor, Nancy L. Jackson. Crossett, K. M., T. J. Culliton, P. C. Wiley, and T. R. Goodspeed. 2004. Population trends along the coastal United States: 1980–2008. NOAA/National Ocean Service. http://www.oceanservice.noaa.gov/programs/mb/supp_cstl_population.html.